It was just last week that I posted a photo of Blanca, our blind and deaf Great Dane puppy, strewn across her favorite chair in the living room. She's always curled up in it or sitting so her long legs are dangling off the side of the chair, her head tucked down while she sleeps. Thus Alayne was surprised to see her in this odd position. At first she thought Blanca was just getting out of the chair, but then -- as the seconds ticked by -- she realized Blanca was simply enjoying the chair in a new and rather exotic way. Alayne went off to get the camera, and when she returned, Blanca was still standing -- or is it actually sitting? -- like this. She seemed quite happy to stay in this position, her rear end resting comfortably on the chair cushion. ("Hey, that's a real load off my ankles!") As Alayne clicked away, Blanca looked left, right, and down ... looking at exactly what I don't know. But it's as if she were trying out this reverse-Ottoman to see whether it suited her. Blanca hasn't figured out yet that the chair is a recliner, but when she does, I'll never get her out of it. I'm enjoying to see Blanca's photo! maybe she's comfortable in that way! She seems happy and contented! That's how our Doby used to sit on the couch, many years ago. We're on vacation in Maine and spent yesterday visiting the herd of 6 horses saved from slaughter. They are skittish, but I was able to pet some of them. They are in good hands now. She really makes me smile!!!! Its wonderful to see her do these things! Her mother was like that too, but usually she would get into that position sitting on my lap! Blanca, my sweet, you are adorable! I hope to meet you someday soon. Blanca is an absolute clown! Her goofy expression is so adorable....great photo!! 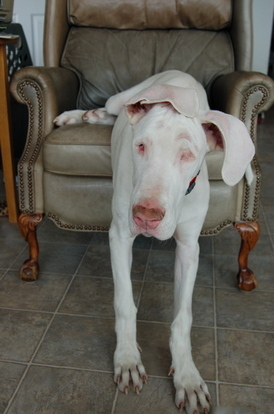 And, given that she is blind and deaf, it is "proof" that the Dane Sit is genetic and/or instinctive. Give that pink nosey a smooch for me! It's SUCH a joy to see her enjoying the good life! GROWING girl, yet still with her fabulous pink nose. Big hugs to Blanca! Thanks for the flashback. I had a greatdane and Dudley would sit like that all the time. Keep doing what your doing. Blanca is certainly creative! I'm tall so I'm going to give this position a try too! Those feet, those ears. What a picture. I wonder if she's thinking that maybe humans need to build bigger chairs. This model, with nothing for the front end, just doesn't seem complete. as a long time fan and owner of great danes, I can testify that this is a legitimate "sit" for a dane. They'll sit this way on chairs, couches, in the car, you name it. The position is just about as famous as the patented "Great Dane Lean" (which other breeds have picked up on over the years...). Whahahaha....you really made my day, again!! Does Blanca realise that she is a Great Dane side-wind-ear-meter, as well?? I hope the draughts aren't as serious as this looks! Blanca is such a clown! I've had several dogs that do this on stairs. (large dogs tend to do this & the majority of my dogs in my adult life have been big dogs) I think she's outgrowing the chair within the week! Maybe this is the start of Danes vs doxies! She knows you put up the wind-o-meter pix the other day, and Blanca didn't want to be outdone. "I'll show you guys C-U-T-E ! ! !" Love those ears! Hey, if she is comfortable--go for it!